A new study by Taub Center researchers Prof. Dan Ben-David and Haim Bleikh reveals that Israel is one of the great anomalies in the developed world when it comes to poverty among the elderly. 50% of Israel’s elderly are below the poverty line according to their market income – that is, before taxes and welfare. This is the lowest market income poverty rate in the developed world. 21% of Israel’s elderly are below the poverty line according to their disposable income – that is, after taxes and welfare. This is the highest disposable income poverty rate in the developed world. Israel’s welfare and pension policies are designed to promote self-sufficiency in older age, but are the least effective in the developed world at reducing poverty among the elderly. 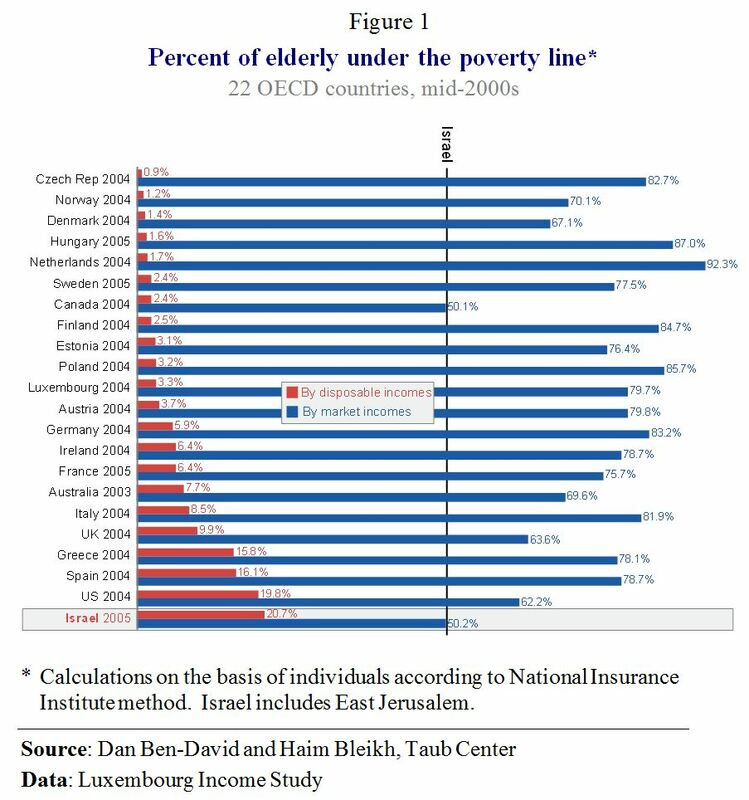 Taub Center Executive Director, Prof. Dan Ben-David: “The case of poverty among the elderly – those aged 65 and over, who are at or above what is generally still considered retirement age in most countries – provides what is perhaps the most striking illustration of the ineffectiveness of Israeli tax and welfare programs in reducing poverty. The problem of market income poverty among the elderly is considerably less in Israel than in the rest of the developed world, but once each country’s social welfare safety net takes effect – then the situation simply reverses, with disposable income poverty among Israel’s elderly rising to the top of the developed world.” As researchers Ben-David and Bleikh point out, “A surprising finding is that the share of elderly people living in poverty according to their market incomes is actually lower in Israel than it is in 20 of the 21 other countries – and it has been declining over the past two decades. The inclusion or exclusion of Haredim and Arab Israelis does not affect the market income poverty rate nor its rate of decline.” In fact, while 50.2 percent of Israel’s elderly would have lived under the poverty line had they been dependent only on market income (Figure 1), over three-quarters of the elderly would have lived under the poverty line in 15 of the other 21 countries. In other words, a smaller share of Israel’s population is elderly, and a smaller share – considerably smaller compared to most countries – of Israel’s elderly would have lived under the poverty line if left to their own devices. Despite the relatively large elderly populations in the other countries, the assistance provided to the elderly is substantially more effective in reducing poverty elsewhere than it is in Israel (Figure 2). The differences between Israel and the other countries regarding poverty reduction among the elderly are substantial. Ben-David and Bleikh find that welfare and tax policies nearly eliminate poverty among the elderly in 12 of the 22 countries, with 95 percent and greater reductions in the rate of poverty from market incomes to disposable incomes. All but two of the 22 countries – the United States and Israel – are able to reduce poverty rates among the elderly by at least 80 percent. By comparison, the United States reduces poverty among the elderly by 68 percent. Israel – with the smallest elderly poverty issue in terms of the extent of market income poverty rates and the relatively small size of the country’s elderly population – only reduces its elderly poverty rates by 59 percent. Consequently, the share of elderly Israelis remaining under the poverty line after taxes and welfare is 21 percent, the highest in all of the countries examined. There are a number of reasons for the large discrepancies between Israel’s relative levels of market income poverty versus disposable income poverty among the elderly. Taub Center researcher Liora Bowers points out that Israel has traditionally had one of the highest rates of private pensions among OECD countries – about 50 percent of Israel’s elderly had a private pension in 2011 – which has contributed to the relatively low rates of market income poverty among them. In addition, Bowers finds that Israel’s average pension “replacement rates” (combining both private and government benefits – generally referred to as public pensions) are slightly above the OECD average, meaning that earning the mean wage throughout their career will yield a retired Israeli 78 percent of their pre-retirement wage, compared to an average of 69 percent in the OECD. On the other hand, benfits provide 22 percent of an average worker’s earnings in Israel, compared to an average of 50 percent in the OECD. As Bowers notes, “Elderly Israelis have to be more self-sufficient, as public transfers in the OECD contribute 61 percent of an elderly person’s income – even more in Western Europe – and less than 50 percent in Israel.” Professor Dan Ben-David: “Domestic politics play a double role in yielding these outcomes. First, the share of elderly in the entire poor population is substantially higher in the other developed countries than it is in Israel. So when the other countries implement welfare programs designed at reducing national poverty rates in disposable incomes, it is not surprising that they tend to focus more on reducing poverty among the elderly because that is where they see a greater bang for their buck.” A second aspect of the political dimension is that the demographics of the elderly are simply working against them in Israel. The large elderly populations abroad wield a sizeable share of the voting population, so it is probably no coincidence that they are able to channel this political power towards benefits that almost eliminate poverty among the elderly in some countries. As Ben-David and Bleikh note, Israel’s elderly had a brief period of greater political influence between the rise and fall of a “pensioner’s party.” But as the data indicate, the plight of Israel’s elderly is considerably worse in terms of disposable income than in any of the other developed countries in the sample – this, despite the fact that they are actually better off prior to the implementation of the welfare and tax programs in each of the countries. Prof. Dan Ben-David summarizes: “Israel’s redistributive social safety net of welfare and taxes is not nearly as effective as the social safety nets in other developed countries in reducing poverty and inequality in disposable incomes. This is a major problem in general, and its severity is particularly striking in the case of the elderly. 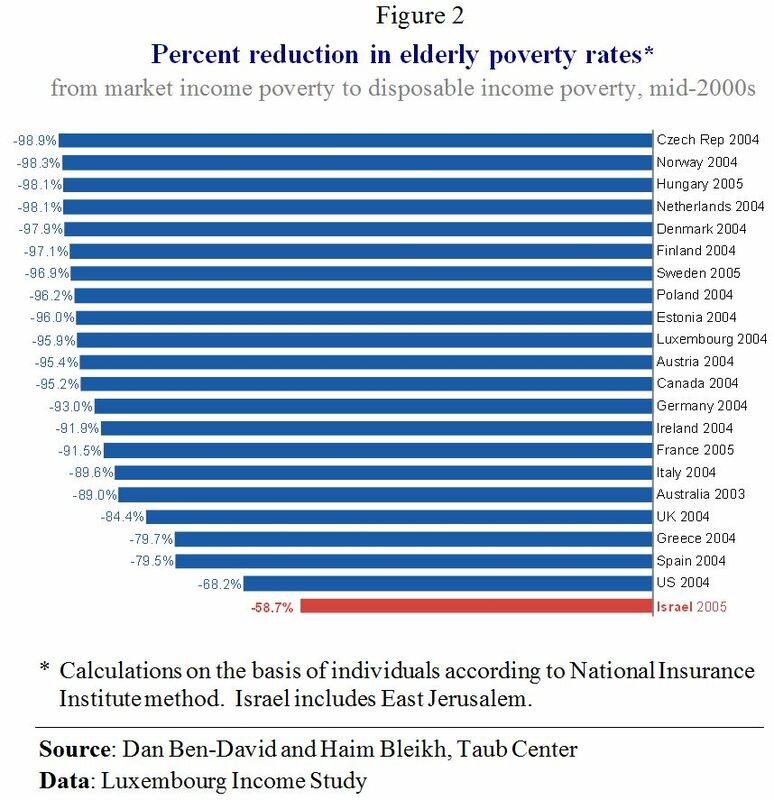 Israel’s market income poverty rate among the 65 and over population is actually one of the lowest in the developed world, and declining (although still very high compared to the general population). However, the disposable income poverty rate for this age group is by far the highest among developed countries. Most of these individuals are beyond the age where working is an option, so they are totally dependent on the system to keep them above the poverty line – and in Israel, this system has failed them more than in any other country.” The Taub Center for Social Policy Studies in Israel, headed by Professor Dan Ben-David, is an independent, non-partisan institution for socioeconomic research based in Jerusalem. The Center provides decision makers, as well as the public in general, with a big picture perspective on economic and social areas. The Center’s interdisciplinary Policy Programs – comprising leading academic and policy making experts – as well as the Center’s professional staff conduct research and provide policy recommendations in the key socioeconomic issues confronting the State. For details, or to arrange an interview, please contact Gal Ben Dor, Director of Marketing and Communication 054-464-2333.